APACHE DEEPWATER, LLC v. MCDANIEL PARTNERS, LTD. This case was pending on merits briefs between November 10, 2015 and February 26, 2016. This case was pending on merits briefs between September 8, 2015 and November 10, 2015. This case was waiting for a decision about briefing or a possible grant between March 27, 2015 and June 12, 2015. In an employee-arbitration case, the trial court agreed with an employee that the agreement was unconscionable. Its ordered addressed only some of the employee's arguments, leaving the others unanswered. 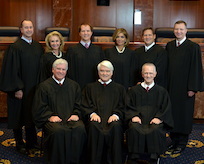 The court did not address any other arguments that Cardwell raised to oppose arbitration, explaining without authority that “as the trial court did not base its determination of unconscionability on those grounds, we need not consider them.” The court of appeals observed in a footnote that Cardwell had not cross-appealed from the trial court’s findings and conclusions or complained of the omission of findings and conclusions.